There are so many things I want for 2019 and each one weighs on me daily. Good things. Fun things. Hard things. Impossible things. But I’m not worried because God is one of #AshleysAmigos. I know. Sounds easy, right? I can do all things because #God and #blessed. Well, for me, none of this is easy. 𝘐𝘵’𝘴 𝘯𝘰𝘵 𝘦𝘢𝘴𝘺 to leave Mario’s immigration process in the hands of the US government. 𝘐𝘵’𝘴 𝘯𝘰𝘵 𝘦𝘢𝘴𝘺 to just trust that God is going to make it rain dollar bills in His own special way. 𝘐𝘵’𝘴 𝘯𝘰𝘵 𝘦𝘢𝘴𝘺 to trust that once we end up back in the States everything will just work out. 𝙄𝙩’𝙨. 𝙉𝙤𝙩. 𝙀𝙖𝙨𝙮! But then I remember all the crazy hard things God has accomplished on my behalf – raising $3500 in monthly support? No problem for God! Holding back the rain clouds during the wettest season of the year for our beach wedding? God #CrushedIt. Providing a roof over our heads, food on our table and jobs to pay the bills? 𝘞𝘩𝘢𝘵? 𝘓𝘪𝘬𝘦 𝘪𝘵’𝘴 𝘩𝘢𝘳𝘥?! Thank you for your patience and grace while I have been busy here in El Salvador with a thousand things, except, apparently – email updates! Life has been a whirlwind of teaching, coaching and of course – loving on my handsome husband (it still tickles my heart to say that – “my husband”)! I will try to be brief (oh but how I love the details!) in my update of the past few months! Celebrating my birthday with Mario and some of our most beloved friends! Back in August, I began teaching at Colegio Salvadoreño Inglés (CSI), a private school in San Salvador. I teach Environmental Management to 10th graders (basically how to save the planet), literature and writing to 11th and 12th graders, and English as a Second Language to those same 12th graders. The school is bilingual, so I teach all my classes in English! When I stepped out of Walnut Ridge High School for the last time in May 2015, I swore to the Good Lord and anyone who’d listen that I was DONE teaching. “Teaching just ISN’T for me!” I declared. Well, turns out I was wrong. I would return to teaching and I would finally fall in love with the job. Sure, it’s stressful and overwhelming at times, but it is also fulfilling and fun. Everyday, I find some moment of calling. When Gabriel smiles at me in the hallway, I know I’m where I’m supposed to be. When Rebeca looks at me with a trust few other teachers have from her, I know I’m where I’m supposed to be. When Alejandra stays after school every Monday for our Sisterhood group that hasn’t quite caught on yet, I know I’m where I’m supposed to be. Sisterhood is what happened after God jolted me from my sleep one November night. To read more about the vision and how you can pray for this group, click here! We continue to meet each week, but most weeks it’s only Alejandra and me, sometimes only me. Who knows…maybe Alejandra is my starfish. Maybe it’s enough that they know every Monday, from 3-4pm, Miss Ashley will be sitting in the 12th grade classroom, ready to be a safe place when they have nowhere else to run from their storms. When I am not in the classroom, using all my willpower to not roll my eyes at one more student who forgot his textbook, I am coaching newbie missionaries in their initial phase of support raising. This is done through weekly phone calls in which I hold them accountable to their goals and pray them through the valleys of rejection and the mountains of affirmation. I am blessed to have yet another job I love. I may not have all the answers to their logistical questions (I’m still learning too! ), but what I lack in knowledge, I make up for in heart. I have been where they are and I have felt the joy of reaching that 100% financial goal. It is a privilege to walk with them on their journey from accepting their calling to their first step on their mission field. Next month, on March 13th, I will head to Raleigh, North Carolina for a Reliant New Staff Training at Summit Church! USA! USA!I am so excited to be back on US soil for a few days (you know imma get me some Chick-fil-A Gospel Bird!)! But I am SUPER excited because last year, I went to this same training and got my first batch of trainees. I will get to see them and catch up with their first year of work! My first trainees from Summit Church (April 2018) – Keevy, CJ, Cody + Alexa! God came through big time to allow this trip to happen. At the school where I teach, we do not get paid time off/vacation days, so I had to ask for special permission to be gone for four days – something that most teachers don’t usually ask for! After a little convincing, the head director gave me permission to leave for the States! I will be Stateside from March 13th – 18th in Raleigh, North Carolina. Unfortunately, I won’t have time to travel back home to Ohio, but it will be nice to be back for a bit! Yesterday, February 8th, Mario and I celebrated eight months of marriage! Phew! When people ask how it’s going, my only truthful answer can be that it is everything. Name an emotion and marriage is that. Happy! Oh, for sure! We are definitely happy! Confused! Definitely. I mean, why can’t he just squeeze the toothpaste from bottom to top?? Amazed! YES! I am daily amazed at how hard Mario works and I know it’s not for his personal gain but for our family. Sad! Sure, we all have moments of sadness, but now I have someone to sit beside me as I cry, whether it’s over another unanswered phone call from Dad or because there are so many puppies on my Instagram feed and zero in our apartment. Sometimes I find myself looking into his eyes, speechless at the fact that this handsome, hard working, tender man will be by my side for at least 95 more years. So yeah, marriage is good. Our first Christmas together as husband & wife! So what now? 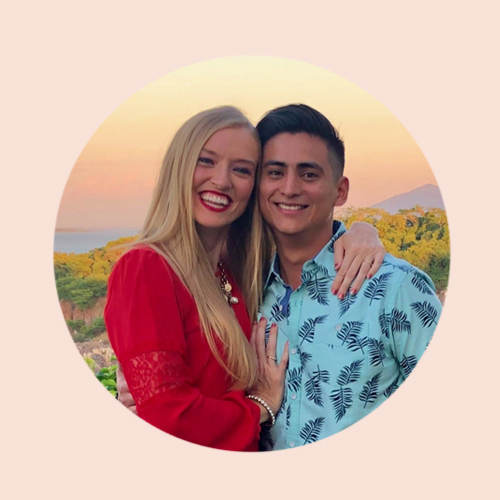 For the past four years, I have been looking ahead to something – the move to El Salvador, the wedding, a suitcase filled with Chipotle from a mission team (still waiting on that one)…so now what am I waiting for? Now, Mario and I are waiting to move back to the States, most likely Ohio. It has always been our plan to head back a year or so after getting married. We love our friends and family here, but we see a brighter future for our family in the States. No country is perfect, but between the violence, poor healthcare and political unrest in El Salvador, Mario and I have decided that moving north to the US is the best plan for us. This means that Mario must get a residency visa (also known as a green card). Right now, he has a tourist visa, which is great, but in order to live legally in the States, he needs a green card. Using a Columbus, Ohio based lawyer, we began the application process as soon as we were married. The first step was a petition requiring us to prove to the US government that we got married for love and devotion to one another, not just for a green card. On January 6th, we were notified that our petition had been approved! HALLELUJAH! I won’t get into all the tedious details here (message me if you’re curious! ), but I will tell you that if everything continues to go as planned, we could be in the States by this time next year! There is so much to think about and so much to plan, so for now, we are just taking it one step at a time. We will continue to keep you updated as the application progresses. More than anything right now, we need your support and prayers for a smooth process. Thank you for continuing to love and support Mario and me. In this time of momentary stillness while looking forward to change, I lean on God’s Word to give me the direction to move or the courage to still. This verse is everything to me. God has promised to guide us. He knows our desires and when we feel like nothing is happening, He will strengthen us in the waiting. If we stay connect to Him, the Source of Life and the Provider of Joy, He will be our Redeemer of Dreams. Your continued support is what allows Mario and I to do our jobs here without having to worry about how we will pay rent, if we have enough money to afford groceries and it is definitely helping in planning for our future! That the girls of CSI would come to Sisterhood and that it would be a place of trust among friends, old and new. That Mario’s job would be a place of happiness and not continual stress. That God would provide the needed money for Mario’s green card process and our subsequent relocation costs and that everything would continue to be approved. In my 33rd year, God brought me the wedding of my dreams with an adoring husband, a cozy apartment, and TWO fulfilling jobs. In year 34, I am asking God for BIG things, only God things. I have been really good at asking for things from Him, but trusting Him with my heart’s desires…well that has been my weakness. I know what I want, when I want it and how I want it to happen. See, I’m real good at telling God just how He should bring my prayers to fruition. So in year 34, as I ask God for BIG things, I am also asking for big trust; trust that He knows what He’s doing and He knows what is best for me. Trust that even though I may not be able to see the fruits of His work (yet), that He IS working. Trust that I can release my inner control freak and embrace God’s loving kindness for me. Ohmygoodness – it has been since July that sent out an email update and since JANUARY that I posted one here! Let’s just say between our dreamy marriage and my new teaching job, life is busy! On December 12th, I go on Christmas break until January 3rd! PRAISE! I plan on spending lots of time updating the blog! Hopefully, that first week of break (maybe sooner…Let’s not promise tooooo much here, Mrs. Ramírez!) I will post an update on the past five months! I am reaching out now because I have a serious prayer request. Well, it’s a praise that has turned into a request. As many of you know, my heart beats for youth ministry. Before moving to San Salvador, I was a youth leader within Rock City Youth and it was my jam. Those girls were my life and it devastated me to leave them. When I moved to San Sal in April 2016, youth ministry was not in my job description. For the past two and a half years, I have yearned for an opportunity to get back into it. About two months ago, I felt a spiritual nudge to reach out to one of my 11th grade students and begin a mentorship. We tried to meet up, but when it didn’t work out, I backed off, waiting for another nudge. This time the nudge wasn’t so gentle. This time, God had me gasping to breathe. I jolted awake at 2am one morning, desperate for air. If I was to keep breathing, I needed to begin a girls’ ministry within the walls of my school. This wasn’t an idea. This was a calling. Unsure of how to begin, but totally sure I had to, I prayed and spoke with the school administration. Step by step, I moved up the ladder until I got to the school director, aka The Boss Lady. One day, she called me into the hallway. I don’t care how old you are or how long you’ve been teaching, when the school director calls you into the hallway, fear cascades down your spine. And here it is friends. Being a girl is just plain hard. We wonder if anyone else is going through the same thing and we wish we had someone we could be really real with. Sisterhood is a girls-only group starting at our school, where girls searching for real friends and real talk can come together in a safe space each week to laugh, share, ask questions and just do life together — all to encourage each other on their own journey to becoming the confident, beautiful and strong women God designed them to be. The Boss Lady loved it. I was told I could invite 25 girls from 10th – 12th grades (the classes I teach). This past Thursday, through our school’s holiday grams delivery service, I sent out 15 invitations to the core group of girls. The night before, Mario and I prayed over each invitation, we prayed for each girl by name. As I watched the invitation delivery, my spirit was filled with fear. Will they want to come? Will they think this is weird? Ohmygoodness. I got one. Just one out of 15 girls was a win. But God had bigger plans. By the end of the day, THIRTEEN girls responded yes. And four of those girls weren’t even officially invited, but wanted to come because their friend was invited. Friends. I am so excited. God is doing something here. He is getting ready to change lives. And I get to be a part of it. I’m back in Youth Ministry. I’m not sure exactly what I am doing, but I am trusting God’s leading. That midnight gasp thrust purpose into my lungs and I finally feel like I am breathing again. Our first Sisterhood meeting is tomorrow, Monday Dec. 3rd at 4pm eastern time. It will be our only meeting before Christmas break. Will you please cover us in prayer tomorrow? That all the girls that said they would come, come! That I am filled with boldness and confidence and not fear. Fear is a liar. Thank you friends for your prayers and encouragement. God is moving. 31 days of 2018 came and went in a whirlwind! Grab some coffee and let’s catch up! January was a month of planning! The Children’s Development Centers (CDCs) have been on vacation and our English Academy was on break, so I had time to devote to lots of dreaming! Starting tomorrow, February 3rd, Iglesia Gran Comisión will begin its second semester of our English Academy (Academia Gran Comisión)! The heart of AGC is to appeal to the people’s desire to learn English and use that to share with them the love of Christ. Not only are students receiving English classes, but they are also receiving Jesus’ Gospel truth and tangible examples of His love. I will be teaching the advanced level classes. I am excited to see returning students and make new friends! Along with teaching in the Academy, I will also take over teaching English in both of our Development Centers! I have been fortunate to build strong relationships with the staff and children in our Soyapango Center, but I honestly didn’t spend much time at our Volcano Center. I am looking forward to building friendships with the children and parents there! I have spent the past few weeks lesson planning for both the English Academy and the CDCs. As are most things in my life, I am learning as I go – hoping to provide an imperative skill to people and children I love while showering them with the love and grace for mistakes God (and my Salvadoran friends!) have has given me. As you can imagine, since December 30th, I have become a wedding planning MACHINE! We are getting married June 8th, a mere four and a half months! 18 weeks! 126 days! So at any moment, I have approximately 27 tabs open to a variety Pinterest searches and Etsy conversations (thank GOD for the internet!). Planning is going very well! So far we have a venue locked down (toes in the sand, you know it!) and even a few friends from the States already have their plane tickets! Last week, Mario and I even signed a lease for an apartment! It’s fully furnished, so we don’t have worry about buying furniture or appliances! We will start moving our stuff in on June 1st and then our first night in “La Residencia Ramírez” will be after the wedding! The next six months for me will be a time of transition. Not only will I change my last name, but I will change my responsibilities within Reliant. My last day as a full-time missionary with Iglesia Gran Comisión will be Friday, April 27th. My job as a missionary is 24/7. My life is pretty much my work. And I love that! I love my life and I love my job, so that works out well! There are things I am able to do as an unmarried woman that will become difficult as a newlywed. For example, when our church hosts mission teams from the States, I am with that team from 6:30 in the morning until around 8 o’clock at night. And I love it! Working with mission teams is one of my favorite parts of my job! But there are times when we have two, even three, mission teams in a row. That means 21 days without a day off. As soon as one team leaves, another one is already here. Now imagine I’m just married (soon we won’t have to imagine it!) and that is my schedule for the month. Not so great for the developing marriage. I’d be hurt if that was Mario’s schedule for a month. At the end of April, I will take a step back from full-time ministry and enter into a new role with Reliant. I still have a heart for missions and want to see the Gospel of Jesus Christ taken to every sunny beach, every dark alley and every unreached person. I do not want the people I serve in San Salvador to suffer because I am unable to serve them with all my time as I was before, and I certainly do not want my marriage to suffer because I am giving all my time to my work. We have classes at the English Academy until the end of May, so I will continue with those responsibilities until May 26th. I will continue to volunteer with the church, but as a regular church member and not a full-time missionary! I will still be working with Reliant, but my ministry will change. I don’t have a lot of details on this yet, so I am going to leave you in suspense until next month when I hope to have more solid details! I love that I get to partner with each of you on this journey! Some of you may have supported missionaries before who left their ministry completely after marriage- that is not my case. Although I will not be working full-time with the church, I will still be working in ministry with Reliant (more details coming soon! ), so your continued giving is vital during this time! Your support is what allows me to do my job here without having to worry about how I will pay rent to Pastor Victor, if I have enough money to afford groceries and, every once in awhile, your support even allows me to have girls night with the ladies here I cherish the most! Change is risky and at times, it is difficult. But what I know for sure is that God is with me through it all, and more than anything, change is exciting! Thank you for walking with me through this time of transition! If nothing else, change is best experienced with you all at my side. Hola? Aloha? Χαίρετε? Let’s stay in touch! I love videochatting with friends back home! Send me a message and let’s plan something! For the children at the Development Centers – that they would continue to know and feel Christ’s love for them in this new year. For Mario and I as we continue planning our wedding and our future. This time can be stressful and fun. We want more of the fun! That we can sell La Gorda (my car)! Mario and I have decided that we will share his car and use the money from selling my car towards our future together. I have posted the car online in numerous places and put FOR SALE signs in the windows…no bites yet. That our wedding would be a reason for people to come together after years apart. Don’t fret or worry. Instead of worrying, pray. Let petitions and praises shape your worries into prayers. will work you into his most excellent harmonies. I hope everyone up north is staying safe and warm! Pour yourself some hot chocolate and see how exciting December was! Most of December was spent back in San Salvador! I came back right before the super cold hit Ohio, so it was perfect timing! It felt so great to be back in my Salvadoran home, with my Salvadoran friends and my missionary coworkers, Ali and Moriah! It actually did take a little bit of time to get back into the swing of Salvadoran life (toilet paper in the trash can!)! December was full of celebrations here in San Salvador! The weekend after I returned, on Saturday, I got to go to the beach with friends to celebrate Mario’s sister’s 26th birthday and Sunday was our Lifegroup Christmas dinner! It was great to reconnect with so many friends so soon after returning! The following week was filled with Christmas parties at our Development Centers on the Volcano and in Soyapango! We were all bewildered by a magician! He pulled boxes out of empty bags, turned three ropes into one, and in Soyapango, he even made one of our girls float in midair! Each child was given a gift selected just for them. For many of the children, it was probably their only Christmas gift. The parties ended with a traditional Salvadoran Christmas meal – panes con pollo (grilled chicken sandwiches)! It was a wonderful way to see the children after being away for so long! I hope to never forget getting out of Silvia’s truck in Soyapango and being hug-attacked by a beautiful bunch of children, yelling my name! It was definitely good to be back! As a gift to the staff of the Development Centers, we got to spend a day at the beach! The grownups had a chance to be silly for a change! We enjoyed splashing in the ocean, a delicious lunch, and Ali, Alonso (the medical assistant in Soya), and I even had a little rock climbing adventure! The weekend before Christmas brought our annual Iglesia Gran Comisión Church Christmas dinner! This year, both the San Salvador and Soyapango campuses were together in a giant banquet hall at the Sheraton Hotel! Our worship team performed a beautiful set of Christmas songs, Pastor Victor shared God’s Word, and we all enjoyed a fantastic dinner of chicken, mashed potatoes and grilled vegetables! For me, the best part of the dinner was having so many people from both churches together in one place! In El Salvador, Christmas Eve is bigger than Christmas Day! I spent the day at church in the morning, lunch at Pollo Camero and then in the kitchen cooking all afternoon! Mario’s family entrusted me with the responsibility of cooking Christmas dinner! I don’t have much experience in this area, so I went with a tried and true meal – lasagna and mashed potatoes! I know they don’t usually go together, but everyone loved it and we were all STUFFED to the brim! After dinner, Mario’s sister Monica led dance lessons for Moriah and I (Ali left for Ohio earlier in the week! ), and OF COURSE we celebrated midnight with firecrackers! You could hear them all over the country, I think! click here to see me try to light a firecracker! On Thursday after Christmas, the youth from San Salvador and Soyapango loaded into a microbus and headed to the oceanside city of La Libertad for Great COmmission Latin America’s annual youth conference – Infinito! The conference is usually held in Honduras, but because of a presidential election that has led to protesting and riots, it was determined unsafe for us to travel to Honduras, if we could’ve even made it across the border. So Plan B was regional conferences! As much as I love the “bigness” of Infinito in Honduras and seeing friends from other churches, the conference in La Libertad was a giant success. We got to hear messages from Pastor Victor, my lifegroup leader Vladimir, and the youth leader in La Libertad, Giovanni! We worshipped our butts off (literally! I’ve never sweat so much from worshipping!) and two people were baptized on Friday afternoon! I believe that teenagers need a space where they can jump and yell and be the weird children of God that they are, and Infinito is just that. But more than that, teenagers absolutely have the ability to change the world, one neighborhood at a time and Infinito is a place where they can know they are valued, know they can make a difference, and be reaffirmed about God’s love for them. For my job! We have recently gone from four people on staff to two! This means that responsibilities have shifted. Please pray for Ali and I as we navigate our new roles within Iglesia Gran Comisión. For Mario and I! Being engaged has already been super fun, but also super overwhelming! Please pray that we would remain a team as we plan our wedding and our future together and that this would be an opportunity for God’s love to shine through our relationship! For Moriah, our fellow Reliant Missionary. Moriah moved back home to Iowa on Christmas Day to continue support raising so that she can move back to San Salvador full-time! We definitely need her here! Please pray that God would bring people to support her ministry. For all the missionaries we will see this year, our upcoming projects and whatever else God has in store for Iglesia Gran Comisión in 2018! After the past nine weeks in Ohio, this quote absolutely rings true. Before I left to come to Columbus, I told people I was “so ready” to be home for a few months. Now, as I sit in San Salvador, I am “ready to be home again.” I now have two homes – here in San Salvador and there in Columbus. My time in my Ohio home was absolutely wonderful. The entire purpose of my visit was to spend time with friends and family, connect with my supporters and rejuvenate myself to go back to work in San Salvador. I definitely accomplished my mission! When I reflect on my time home, the overarching theme is that even though things change, they stay the same. Columbus itself has changed – new restaurants, new highways, new animals at the zoo! – but it still has that lovely, midwestern feel to it. People smile as they pass by, they help you find that totally random brand of soup your wife sent you to buy, and they’re just all around friendly. It felt comfortable coming back to a place I lived for the first 31 years of my life, but exciting to see all the new things! My people have changed too. Friends have gotten married, had kids, bought homes, switched jobs…It was so exciting to meet my friends’ growing families, hear about new adventures and challenges along the way. But even though the external changes, my friends are still my friends and some things never change. Truly the best part of being home was getting together with friends only to realize that even though years and distance separated us, our friendships remained the same. It was as if no time had passed at all. And THAT was what I needed most of all. Being in the United States made me feel like myself again! It’s true that when you live cross-culturally, you develop a different personality in your second home. Different cultural norms, practices and traditions force you to adapt to your new home’s values. I am continuing to learn to blend in with the Salvadoran lifestyle but with my own “Ashley Flair.” Being home was a chance to express my true self in all of my boisterous ways, surrounded by my tribe of people that know and love me. Columbus and my people within it are not the only things that have changed since I moved 19 months ago. In so many ways, I have changed. I am constantly learning and growing to be the best possible version of myself and this visit home highlighted some of the ways the mission field has changed me. I am more eager to serve. I was fortunate to grow up having all of my needs met even before I could voice them. But because of this, it has been very hard for me to see the needs of others and meet them without being asked. Before San Salvador, I would (usually begrudgingly) help when asked. After San Salvador, I have learned to keep my eyes peeled for ways I can serve without being asked. I am blessed to serve alongside amazing people in San Salvador who daily show me how this is done! I am more flexible in my plans…kind of. This one will forever be a work in progress! To my core, I am a Type A, planning machine. I love to plan events and follow those plans through. But life happens. Rarely do we follow through on Plan A. Life is more frequently lived on Plan L. Before San Salvador, a change in plans threw my life into a whirlwind. After San Salvador, plans changing still freaks me out, but I am learning to handle the chaos like a normal adult. I am in love with Jesus even more. How could I not be? I get to live and work with some of the kindest, most loving people on the planet. It is through them that I have seen God’s biggest blessings – people receiving jobs after months of unemployment, health revitalized, broken relationships restored and people with every reason to exude extreme sadness instead radiating with joy. And I must mention how wonderful it was having Mario with me for the first two weeks! We had so much fun exploring Columbus! We saw the zoo, ate hamburgers LITERALLY the size of our heads, experienced Rock City church, and most importantly, my Ohio VIPs got to meet one of my Salvadoran VIPs! OH! And we became a pupusa making MACHINE! Toting FIVE POUNDS of pupusa cheese to the States was totally worth it! I don’t know when I will be back in the States next, so until then, please keep the emails, phone calls, videochats, birthday cards, etc. coming! Everything you do touches my heart and keeps me attached to my northern home. And I love every bit of it! be cheerful no matter what // pray all the time // thank God no matter what happens. A super special shoutout to Lindsey for letting me stay at her house for 9 weeks! I will forever treasure our time together. We binged on Grey’s, learned how to make lasagna (#pinterestWIN! ), cried together, laughed together, shared our stories and on my very last night, her sweet dog FINALLY kissed my nose! It’s official – I’m in the fam! This world is upside-down. Nothing of this world is how it should be. We live in a world where revenge is sought more than forgiveness. Where lust is accepted more than love. Where what’s outside is valued more than what’s inside. We live in a world where an innocent man was tortured to death for the sins of us all. ⠀⠀⠀⠀⠀⠀⠀⠀⠀ In an attempt to set His world right-side up, three days after He died, God brought that man back from the dead. ⠀⠀⠀⠀⠀⠀⠀⠀⠀ This world will never be right-side up. Things won’t ever quite make sense this side of Heaven. But we can do our part to join God in turning things right. ⠀⠀⠀⠀⠀⠀⠀⠀⠀ Choose never-ending forgiveness. Choose reckless love. Choose to see the heart. Most importantly, choose Jesus’ overwhelming gift of salvation. ⠀⠀⠀⠀⠀⠀⠀⠀⠀ 𝑯𝑬 𝑰𝑺 𝑹𝑰𝑺𝑬𝑵! 🙌🏼 𝑬𝑳 𝑯𝑨 𝑹𝑬𝑺𝑼𝑪𝑰𝑻𝑨𝑫𝑶!